Over the course of the last year, Apple has made several hires from the medical and sensor field, presumably to bolster the team of experts working on its much-rumored smart watch project, and MacRumors today learned of another high-profile sensor expert that has joined the company. Michael O'Reilly, M.D., formerly the Chief Medical Officer and EVP of Medical Affairs at Masimo Corporation, left his position in July of 2013 to take on a role at Apple, possibly on the iWatch team. News of O'Reilly's employment at Apple was first leaked to MobiHealthNews last week and when contacted for comment earlier today, Masimo told MacRumors it "could not dispute" what had been reported. 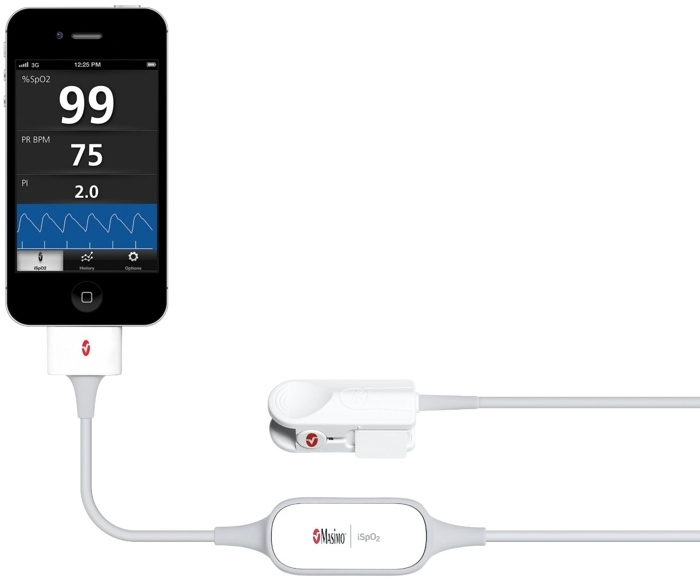 While O'Reilly was at Masimo, the company developed several cutting edge pulse oximetry devices, including the iSpO2 Pulse Oximeter that connects to the iPhone and gives readings via an accompanying app. The iSpO2, which takes its readings from a finger, is designed to measure both oxygen saturation in the blood and pulse rate, with technology that allows it to take readings during movement and with low blood flow. While it is not clear what position O'Reilly holds with Apple or how his pulse oximetry expertise will be used by the company, he does join a number of other hires in the medical field that have reportedly been recruited for the iWatch team. In 2013, Apple hired several scientists and executives from notable sensor companies like AccuVein, C8 MediSensors, and Senseonics, and two weeks ago, another report pointed to two additional hires in the sensor field. Reports have suggested that Apple's smart watch project, the iWatch, could focus heavily on health sensors and biometrics, possibly including features like a pedometer and a heart rate monitor. Apple's multitude of hires in the health field does suggest, however, that the company could include even more advanced sensor technology in the iWatch or in a future product. With the addition of O'Reilly, Apple has now hired employees with expertise in pulse oximetry, vasculature visualization (vein finding), non-invasive glucose monitoring, blood chemistry monitoring via microneedle, heart/breath rate monitoring, and fitness. Notably, several hires have also had experience with low-profile, non-invasive biosensor devices. On his LinkedIn page, O'Reilly is also listed as both an Adjunct Associate Professor of Anesthesiology at the University of Michigan and a Professor of Anesthesiology and Perioperative Care at the University of California, Irvine. damn! this iwatch is going to be a mobile hospital! The only thing I don't understand is whether or not this will be stand-alone device or not. The only thing? Nobody knows any thing. Just wait till you see the prostate exam app! I hope people can understand the potential of this product by now. Yeah, the sad part is that people still don't. 'Watches are useless'. Good thing Apple actually has intelligent, imaginative people working for them, as opposed to the people who can't even think past 'It tells time'. At last, the penny has dropped for the watchers. The iWatch may well have some form of simple monitoring, but I reckon Apple is going much further into the medical field. Already iPads are used extensively in hospitals for displaying scan and x-ray results. Integrated medical systems could be the next big field for Apple, just as instrumentation was for Hewlett-Packard in the 1960s. Could stray into Agilent (http://en.wikipedia.org/wiki/Agilent_Technologies)'s backyard. Let's put it this way: It will put the "i" in iWatch. I suspect you are onto something This is why I thought Apple might make a play for the remnants of Kodak, with their medical imaging products and patents. The iWatch is gonna be awesome! I'm still totally unsold on the idea of carrying around a mobile medical station. I'm not a professional athlete; I don't need real-time statistics on what every organ in my body is doing, how much energy I'm using, etc. The Tarahumara people (http://en.wikipedia.org/wiki/Tarahumara_people) can run 200 mile-stretches over a couple of days, and AFAIK they don't use fitbits, Nike smart watches, iWatches or anything else. They drink beer and eat beans and squirrels. Not just their young people, either - even the middle-aged and elderly can run enormous distances. Point is: teching yourself up doesn't make you healthier or fitter. Some of the most primitive people on the planet could put our best olympic athletes to shame. That said, of course, I said I'm not sold on the idea. Maybe Apple will convince me, but if this really is a "health" statistics device, then no thanks.